Yangshuo is a picturesque riverside town near Guilin in South East China. Yangshuo is a popular place for its stunning river winding through the karst mountain landscape and rice fields. There are plenty of things to do in Yangshuo. We spent almost a week in the pretty village enjoying its relaxed atmosphere and had to drag ourselves away. 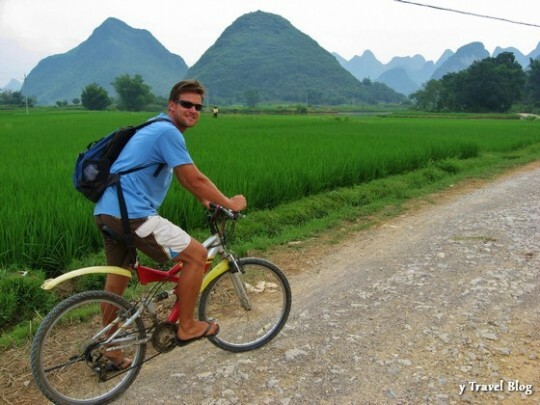 On our last day, we decided to hire bicycles to go cycling through the Yangshuo countryside to the nearby town of Fuli. It was a bumpy old back road that took us past farmers ploughing the fields with their buffaloes and little farm villages along the winding river. 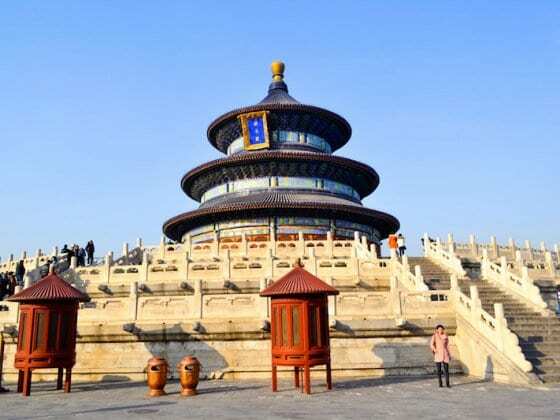 We eventually arrived in the old Chinese town to wander the streets and to check out the strangely charming historic buildings and the fans they are famous for making. As we were walking within the city walls by the river we were accosted by a small group of elderly friends sitting around a table by the river under an umbrella playing cards, singing and chatting. They were excited by the foreign visitors and filled us with endless cups of green tea, peanuts and biscuits. When it became evident that communication in Chinese was not going to happen, they whipped out their pen and paper and wrote down what they wanted to say in Chinese characters. Ahh! So that’s what you were trying to say. When all else fails, you can turn to the universal language we all understand- music. They got out their Chinese songbook, put on some music and started singing to us. Slowly they began to unveil their good China for instruments, passing us the wooden bangers and clappers instead. And then we started jammin. We laughed and sang together, and I’m sure my attempts at following their lead to sing in Chinese sounded Russian to them, but they thoroughly enjoyed it and so did we. Our Tommy Lee style finale got us big thumbs up and huge grins. They were really disappointed when it came time for us to bid them farewell. Random travel encounters with the local people are so memorable. Sometimes even more so than the beauty of the jungled river landscape. What have been some of your memorable cycling or random stranger meetings on your travels? We loved this region in China. Could of stayed for weeks. Totally agree on the pace of travel whilst cycling. We would love to do more of an extended cycling adventure. Just don’t like any hills or head winds, lol. Love those mountains in the background! Seems like a well-rounded day. City streets, countryside, and biscuits with little old ladies! Love the scenery! I would love to do a bike trip like that. Re Random strangers, I love meeting them but sometimes they turn out to be born moaners and they are the ones that I hate. My hubby normally manages to win them around though! Looks like you guys had a blast. We loved Yangshuo and the cycling too. Not the most comfortable bikes but the scenery is to die for. Great photos guys! Music is the international language. Thank you for sharing your experience! I love reading stories about encounters with locals in small places. Seems like such a fun day. I really enjoy exploring a town by bike too. Just spent a few days in Yangshuo China volunteering at an English College. Really loved it there and especially the time we spent with the students. One of the days we rented bikes and went out in the countryside with one of the students and a local friend who showed us an interesting countryside route to the Dragon Bridge – it was truly a great experience! It’s so beautiful. Riding a bike is the best way to see it and so relaxing. Cool way to explore Yangshuo! Btw, may I repost your articles in my website in your name? 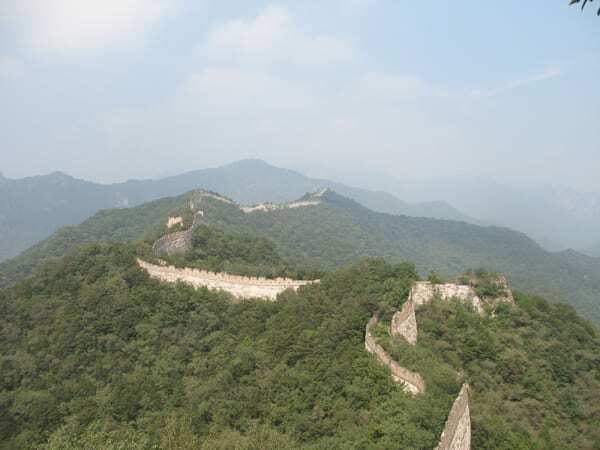 http://www.hichinatrip.com We are writing blogs, guidebooks and also sharing blogs for travellers in China.